This pattern, Lightfrost by Louise Zass-Bangham, alternates silky stripes with translucent stripes. My recent attempts at other knitting projects reminded me I’m still very much a beginner. So I decided to try this super simple triangle shawl. The graphic effect of the stripes is a good pay off for something rather simple. I’ve also learned I really like sh*tloads of stockinette, and I’m OK with that. The original pattern calls for Debbie Bliss Party Angel, (4% Metalized Polyester, 72% Mohair, 24% Silk) for the contrasting (transparent) colour. But around the time I started thinking about this pattern, Fyberspates came out with Cumulus, (74% Alpaca, 36% Silk). It’s a heavier weight and less yardage than Party Angel. It’s also *exactly* the same colour as the main yarn. This means the design has a more subtle effect. Because of the yardage, I needed two balls of Cumulus. I wasn’t able to finish 8 rows of the final repeat. So it was pretty close. You could possibly just skip the last repeat if you wanted. But I really wanted to stick to the pattern. I cast off with an “Icelandic bind off” which I found in the “Cast on, Bind off: 211 Ways to Begin and End Your Knitting” book. It comes out sort of “round” on the end, and it blends nice with garter. It was listed as a stretchy bind off. dropped two stitches. trying to show where this was. 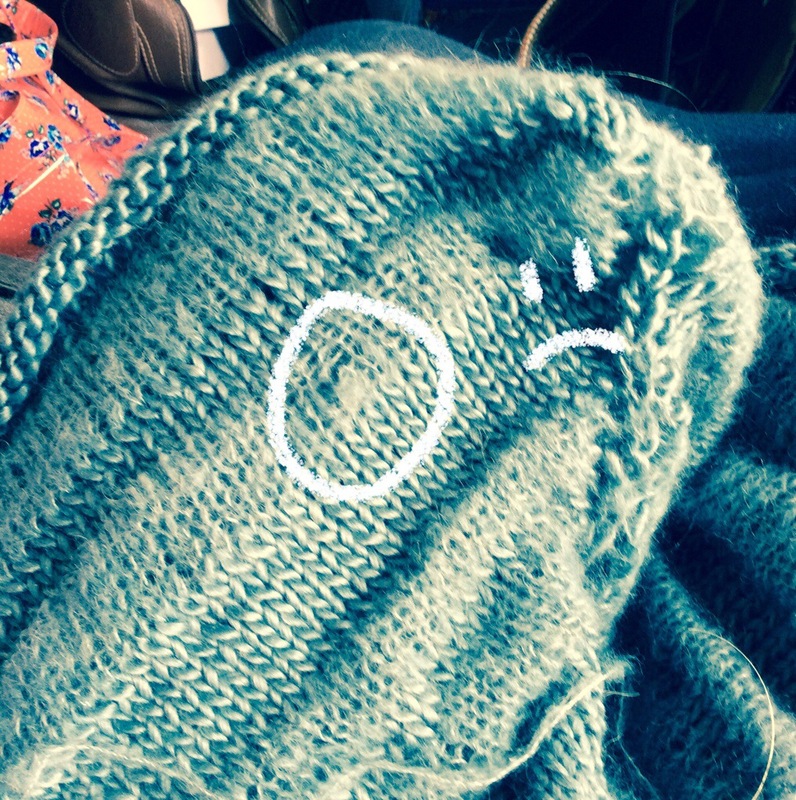 I was at a knitting meet-up at the time, and generally we all thought it would be impossible to rip out. But it came out smoothly, which was shocking. Maybe it’s because of the loose gauge? Frogging was bit of a set back, but I learned to be more careful in checking my stitches more frequently. I liked the idea of buying the yarn from the same company, and supporting them. Here’s a nice interview that the designer Louise did with Jeni from Fyberspates. Jeni’s very driven and works pretty hard. Her mother also works with her dyeing yarns. Though I think Jeni is stepped back from hand dying so she can grow and scale her business. Pretty exciting! Under the label “Inspiration Knits” and for her clients, Louise has 50 tempting patterns. Many accessories, which is nice! I also bought the Song of the Sea cowl pattern. I had seen the stitch pattern elsewhere, but I liked how she had graduated the sizes of waves. 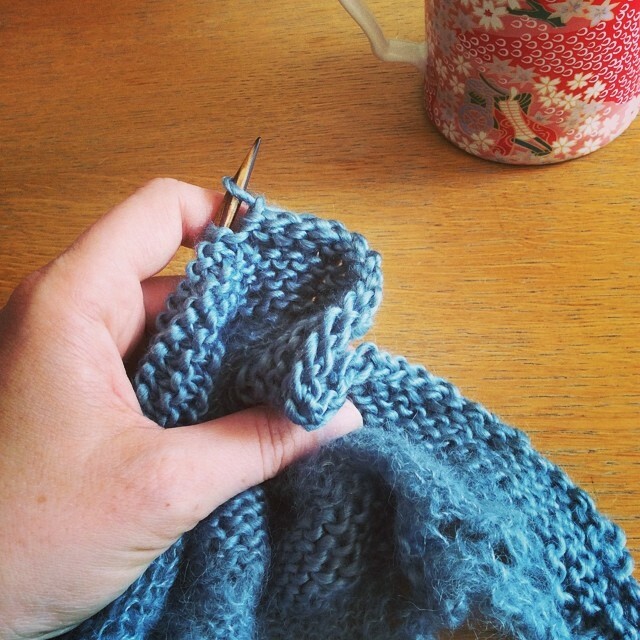 Louise is hosting a mystery cowl KAL, which released clue-by-clue on her blog. The Fyberspates team recommens some yarns for the mystery cowl KAL. We’ll see how I get on with other projects, but it would be nice to pick up some Fyberspates in person at Unwind 🙂 Which is tomorrow! I wanted to post this FO so I can say I have at least something done. I suspect it’s so I can justify a yarn purchase. Eeek! FInished projects ALWAYS justify new yarn purchases 🙂 I love your shawl and the fluffyness of it. Very nice! I also just added the Song of the Sea Cowl to my queue…it’s a dangerous life reading knitting blogs, my queue may just explode one day. Thanks for sharing your gorgeous work and enjoy Unwind! !